Beneath that smooth veneer of professionalism our Editor has a rather gritty personality, so how more appropriate could it be than to ask him to try out this big Hitachi machine and see if he can bring things to a fine finish without sandpapering over the cracks? This Hitachi qualifies for the title of half sheet sander, although half a sheetâ€™s width is also exactly the width of a standard roll of abrasive at 115mm, so you can either used cut pre-punched sheets or use off the roll to suit. This machine I think has been around for a long time and certainly hasnâ€™t given way to the newer jungle stripes design seen on the most recent Hitachi machines. It is big and heavy thanks partly to the heavy aluminium base and the motor on top of it. There are tough plastic levers that operate the heavily sprung metal clamps at the back and front to hold the abrasive sheets. Underneath a polished aluminium platen with extraction holes has a dense foam rubber covering applied to it. Apart from the on-off switch trigger and the slide on dustbag that is all there is to this sander. 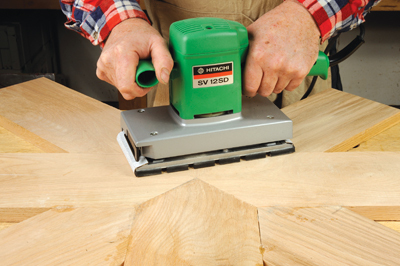 Although this sander has a small 2.4mm orbit, its pad size combined with coarse abrasives make it more of a roughing sander, though this is not stated as such. Its size and weight alone make it a very effective machine, although the â€˜scratchâ€™ left behind will depend on how fine an abrasive is used. For use in the joinery shop or on site this is not a great issue compared to cabinetwork with the need for fine finishing. No abrasive punch is supplied and bearing in mind how thick the sheets are, a punch might be pointless. The supporting metal arm in the dustbag supplied for test broke and we asked for a new one, hopefully this was just a one off failure. 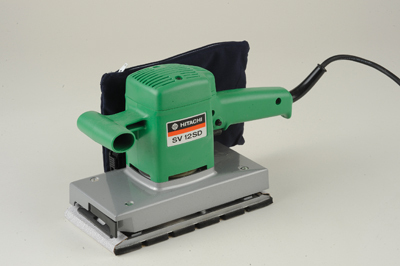 However, price apart this is an impressive sander, comfortable to use and rapid results with moderate noise and vibration levels. A heavy and stable machine with a great finish.